Since it’s a Sunday with a waxing moon, hangover notwithstanding, I’m finally getting around to consecrating my Ring of Solomon under the powers of the Sun. 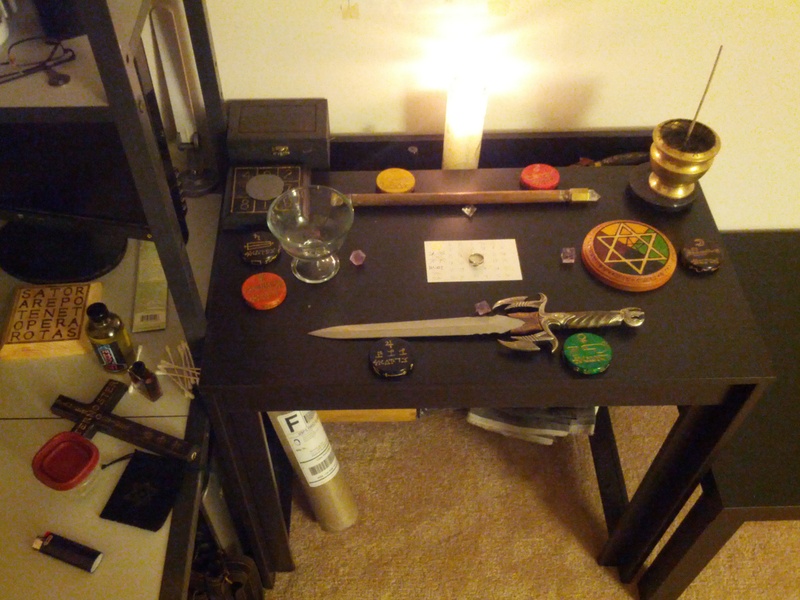 In that picture, you can see my Table of Manifestation on the right with the Ring in the middle sitting on top a hastily-written Table of the Sun, with the symbol of the Sun in gold leaf and its sigils and names, and on the desk you can see some extra supplies: Abramelin oil, frankincense incense, container of Goldchläger, cotton swabs, and so forth. It’s all part of the consecration ritual I’m conducting for this neat little tool. Consecration is a powerful thing, especially when you know how to handle the consecrating forces appropriately, but doesn’t always have to be done. A lot of plants, stones, gems, and liquids have natural occult virtues that suffice without any extra empowering, though charging them or blessing them is certainly a helpful option. Some tools don’t need to be consecrated at all, and the Lemegeton’s Goetia doesn’t give any instructions on how to consecrate the thing; I suppose this means that the ring is consecrated by construction. Timing may help with consecration, and this is in fact the entire basis of astrological magic, where you want to time an event or act of creation under a particular arrangement of planets in the sky. For me, though, I like invoking the proper powers and having them bind and mingle with something to consecrate or empower it. Figure out the desired qualities of the consecration, and pick the planet you wish to consecrate the item under. Procure the item. If possible, make, or buy the item in days and hours of the planet. If this is not possible, in a day and hour of the planet, formally state your intent and purpose of the item’s use to you at your Table of Manifestation (working magician’s altar), devotional altar, or other sacred place. When not in use, keep the item at this place of power. In the day and hour of that planet, conjure that planet’s angel (based off the Trithemian ritual of conjuration) and ask them to”consecrate, sanctify, bless, dedicate, and empower” the item under the powers and blessings of that planet. Ask them to bring their associated intelligence to open the way for the energies to flow into the item, and ask the spirit to infuse the item with the planet’s power. Clearly state your intent as to the consecration’s purpose. If they decline, ask why and see what changes might need to be made so as in order to proceed. For the next few days, in the hour of the planet, charge and bless the item under the blessings and powers of the planet in the name with the aid of the angel. Repeat the Orphic Hymn over the item. The number of days and the number of repetitions of the Hymn to be done should equal the number associated with the planet. This is to be done either on one’s Table of Manifestation or in the light of a colored candle burnt as an offering to the planet’s powers and entities on a devotional altar. Optionally, suffumigating the item in incense associated with the planet may be helpful. Once step 4 is complete, again conjure the planet’s angel in their day and hour and ask them to fully consecrate, charge, infuse, and bless the item in the power and glory of the planet’s full force and power as regards your specific need. Thank them for their aid and assistance in the matter. Carry out the process for six days, starting in an hour of the Sun on a Sunday during a waxing moon. It helps that the Sun is at its highest northern declination, giving it an extra boost of power at this time of year. The repetitions of the ritual will take place in hours of the Sun (probably all nighttime unless I can swing a daytime hour after I get home from work) and will finish up on this Friday. Each ritual takes about 20 minutes. The statement of intent for this ritual is to empower the ring to lend me the protection, guardiance, light, authority, and fire of the Sun as I wear it, so that no spirit bring harm to me and that I have the strength and authority to conduct and conjure spirits and forces of the cosmos. I anoint the ring with Oil of Abramelin and Goldschläger, suffumigating it in frankincense incense. Since I use my Table of Manifestation with all its planetary and elemental tools and weapons, I’m using the Wand (symbol of Fire, director of Will and force) in conjunction with the Talisman of the Sun to direct and guide the appropriate forces into the Ring. The planetary talismans are basically weapons tailored to their individual planets, hence the use of that particular talisman. I pray over the ring once per repetition of the ritual with the Prayer to Saint Michael the Archangel. So, come next Sunday, I’ll have a very nifty and powerful addition to my tools, and probably one of the most important. Besides, the extra solar energy in my life is no bad thing, and will help out in some of my other work I’m doing at the same time. I’m always impressed with the quality of your invocations and the depth of your work. I’m feeling deeply outclassed here, as often the case. There must be something about being a software developer that leads one to do quality work. My own work, by comparison, has been rather slapdash. Oh jeez, now you’re just flattering me. Honestly, I feel like everything I do is slapdash and messy; if anything, invocation and consecration is among the more straightforward(but vital) parts of my Work. It takes a bit of know-how, but this methodology seemed pretty apparent and simple to me. It’s involved, sure, but simple: figure out what you need, ask the right guys for help, repeat for X days to reinforce it, thank the guys for their help. Besides, I’ll wait until I actually use the finished product to see whether or not I did a good job. Besides, you should have seen me yesterday. After two gallons of sangria, plenty of hottub and hookah, and Lord knows how many makeout sessions I had on Saturday night, I spent half of Sunday (and two vital hours of the Sun I could’ve used) nursing a hangover and eating Burger King and not like, you know, prayer and crap that’d’ve been making myself more useful. Meh.